For shops who did not order the amazing Knog Frog lights first time around, Person-Majestic, the exclusive U.S. distributor of the unique lights, has just received a new shipment, including the popular red & white twin pack. "Our existing dealers have done very well with the Knog product line," reports Charlie Persons, President of Persons-Majestic. "We now have sufficient inventory to add more dealers." 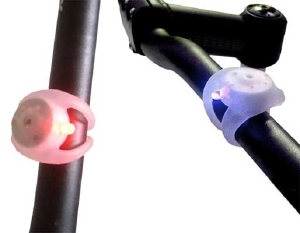 The Knog Frog's unique design allows the light to be clipped onto practically any part of a bike including the handlebars, seat post and anywhere on the bicycles frame. The light will last for up to 360 continuous hours on one set of coin cell batteries and features both a steady and flashing mode. Weight is a miniscule 12 grams. The Knog Frog carries an MSRP of $9.79 for the single light and $18.89 for the twin pack. Persons-Majestic also announces that it has all Valore bags in stock including the popular Valore Trunk, Single and Twin bags. For details, call 1-800-772-2453 or e-mail permaco@aol.com.